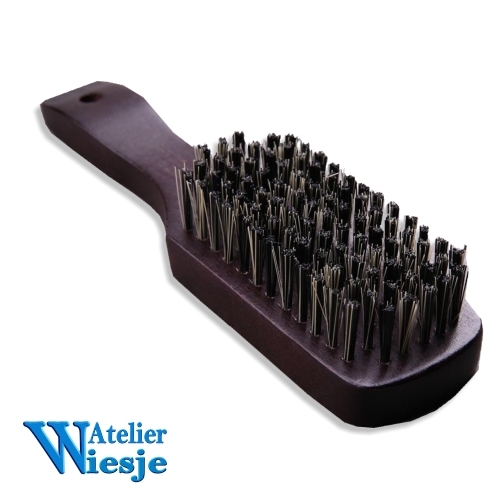 The Boar Bristle Brush is used to remove any loose or poorly rooted hair. Use for removing loose hair after rooting. The Boar Bristle Brush is used to remove any loose or poorly rooted hair strands in the dolls head. the bristles are soft enough to not remove well rooted hair but is hard enough to take out the hair that is poorly rooted or not rooted at all. Boar Bristle Brushes will not scratch the vinyl like other types of bristles will. This brand is from the professional hair care industry so it will last long and work well as you prepare your baby's hair. Style, shape, and color may vary.